Metron is the New God associated with curiosity, discovery, and knowledge. 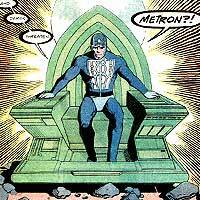 Using his fantastic Moebius Chair, Metron travels the universe in search of new knowledge. Following a battle with the CONSTRUCT, Booster Gold and the JUSTICE LEAGUE encountered Metron, who was investigating the sentient computer that appeared to be controlling the Construct (see KILG%RE). Since that meeting, Booster Gold and Metron have crossed paths occasionally when a dire threat confronted the Earth. 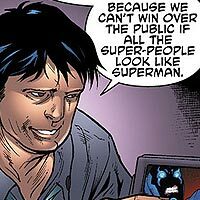 Thaddeus Miller is the founder of Superfail.com, a website and media organization devoted to propagating his anti-metahuman agenda. Booster Gold met Thaddeus Miller by walking into the Superfail offices in Brooklyn, New York and offering his services in approaching BLUE BEETLE III. Claire Montgomery is a professional public relations expert and ex-wife of MAXWELL LORD. She was hired to establish the super hero team the CONGLOMERATE. 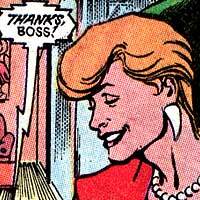 Claire Montgomery recruited Booster Gold away from the JUSTICE LEAGUE in order to lead the corporate sponsored Conglomerate. It was insinuated that she and Booster Gold were developing a romantic relationship. After Booster left the Conglomerate, she remained the manager of the team through several incarnations (see CONGLOMERATE II). Mount Thunder is an abandoned silver mine in Nevada that was converted to a top secret United States Air Force base for use in case of a nuclear attack against the country. 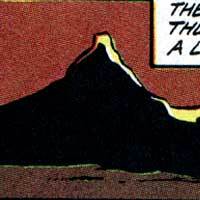 CAPTAIN ATOM believed that Mount Thunder was an abandoned project when Booster Gold and the EXTREME JUSTICE team appropriated it as their headquarters. Actually, Mount Thunder had been converted for use in General Synge's OPERATION FREEDOM RINGS, and General Synge was not at all pleased with Extreme Justice's intrusion.